The alarm goes off at some stupid hour. I ignore it. I'm downstairs at 7:55. Lonely Planet says that that hotel gives rides to the grounds for free, so I ask. 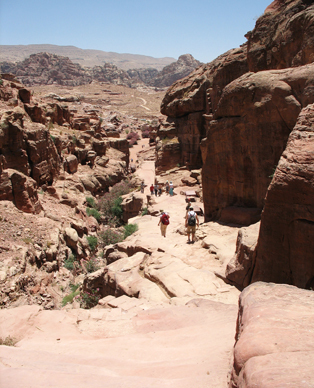 The non-English speaking half of the management team indicates, "Ride to Petra - yes." Nothing happens, so I leave, looking for breakfast and a cab. I ask in a grocery store for a bakery, and I'm given directions. A cab pulls up and I explain that I'm walking to the bakery. He says he'll take me there and then to Petra for 1JD. I agree. After a bit of confusion (I guess that I said "falafel" so I'm taken to a restaurant where I score a remarkable 10 of these tasty greasy things for something like 25 cents) we make it to a bakery, where I feel obligated to buy more food. Then I'm off to the ruins. Just outside the entrance a vendor calls out "Hats, Half-JD!" and at that price I grab one. Today is a chill-day. Instead of again covering miles, my plan is to find a small place to hide out, and just soak up the atmosphere. I linger at a number of rest points this second day. 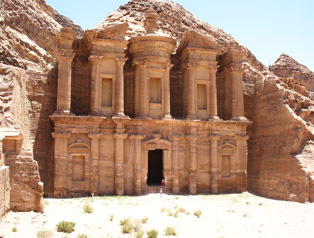 I eat some of my goodies in the siq, then hang out by the Treasury where a film crew is finishing up, then spend perhaps an hour chatting with Ali, a Bedouin shop owner directly across from the Roman-style amphitheater, having two teas and listening to his thoughts on many subjects. Tourism is down. It was 3,000 a day back in year 2000, now maybe 300 to 500. 9/11 was a US-staged event. Why were the Jews warned? Ali had picked up a guard dog, a puppy. I asked him if theft was a problem. "No, only problem is with Israeli tourists. The French too". Ali explained how to make fake coins. Use lead, cover them with tea and yogurt, and bury them for one week. The way to tell a fake coin is to study the edge and see if it was machine stamped. Other governments are shaking down the USA, claiming various incidents as terrorism and getting US dollars to deal with these incidents. I sold a fake coin to a Japanese guy for 50JD. Sold a real silver coin to that guy who just came by for 150JD. Old things are found every year after the winter rains. Yes, Luxor is very nice, but Luxor touts are very very pesky. (I asked him how he-a very Arabic-looking Arab-could be flagged as a tourist.) "They recognize that my accent is different." I leave Ali and drift over to the Silk Tomb, where I hide out in a shallow cave, soaking up a grand view of much of the area. I know that I need closure on the issue of my 12JD fake face. I still like it, but keeping it will just remind me of my foolishness. I toy with walking up the path, finding the woman that sold and simply giving it back to her, but I end up just giving it to another vendor that has some of the same faces in his collection. 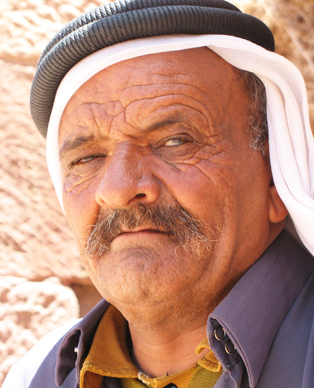 He is a very nice man and, after I add my souvenir to his table, he presses on me a "genuine" Nabataean finger bone. 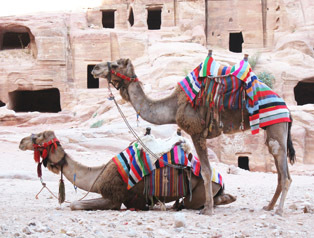 Determine how I'm getting from Petra to Aqaba. Do I veer right at the upper traffic circle, as someone said? Do I take a cab up to the main road, the way I came in? Or do I pay 15JD for a 30-k ride, getting much of the climb out of the way (at least according to yesterday's cab driver, who conveniently left me his phone number!)? Ali, my friend at the Petra ruins. The hike up to the do the Monastery (800 steps) is taxing. But the Monastery is quite impressive (those are people at the base of it).